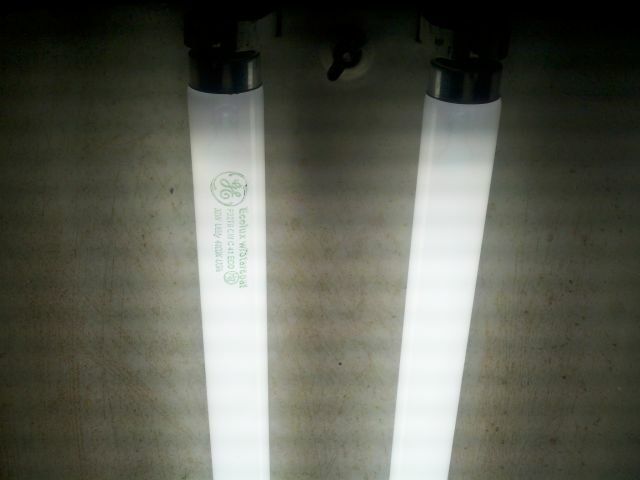 Lighting-Gallery-net - circline and u-bent fluorescent tubes/F32T8 without triphosphors? YUP!!! Here's a pair of new GE F32T8/CW C41s I bought at an Ace Hardware store. It has the broad spectrum unlike almost all modern T-8s. This is basically a F32T8/CWX. Very soft to look at when lit, like the old school preheat F30T8s and slimline F96T8s. If you want to get some, some Ace Hardware stores have them now and be sure to find the ones rated at 1800 lumens not 2500/2600 lumens (the latter are triphosphor). I remember reading somewhere that Osram or Sylvania would produce a series of halophosphate F32T8 lamps, citing availability of rare earth metals. The article mentionned that these lamps could be used in mechanical and storage rooms, and saving the triphosphor lamps for the occupied areas of the building. I also read a separate article saying that China is the leading producer of rare earth metals, and they have political issues regarding the sale of said rare earth metals, which means shortages for the rest of us. We might very well as a result see more and more halophosphate tubes in stores, but in F32T8 instead of the usual 40 watt T12. Can a non-CWX old-school halphosphate F32T8 be made? I've heard the phosphors those use don't take too kindly to being so close to the arc but do laws like EPACT allow a halophosphate 62CRI F32T8 to be made? What about a SP41 one? I know SP41 isn't allowed for F40s anymore though. Sylvania made halophosphor F32T8s in White and Cool White for a while but not anymore due to the July 2012 rulemaking. The halophosphor lamps were made due to the triphosphor shortage. Don't forget they made halophosphor F15T8s and F30T8s as well as the old F96T8 slimlines, and in many cases these operated at an even higher current than the modern F32T8s (350mA for the F30T8, vs 265mA for the modern electronic T-8s), and these lamps did fine with halophosphor. By the way, I have seen a few F32T8s made by TFC in Taiwan, and I have long suspected they seemed to be halophosphor based on the color appearance, even though the ordering code say 741. Recently I confirmed they indeed are, after determining the phosphor decay in the flash patterns detected by my iphone's camera. These TFCs have heavy end bands and bluish discoloration at the ends, old school looking! Yeah they do loook kinda yellow compared to the 800 series. I do like their 6500K Octrons though! Nice lamps! I have 4 of the F96T12/865 75Ws over the work bench! In that 4-lamp fixture that had those Universal ballasts? Or maybe that light from my school I turned into a 3-lamper with that half-dead ballast...it started out as a silly idea and now it's my 2nd favorite fixture!